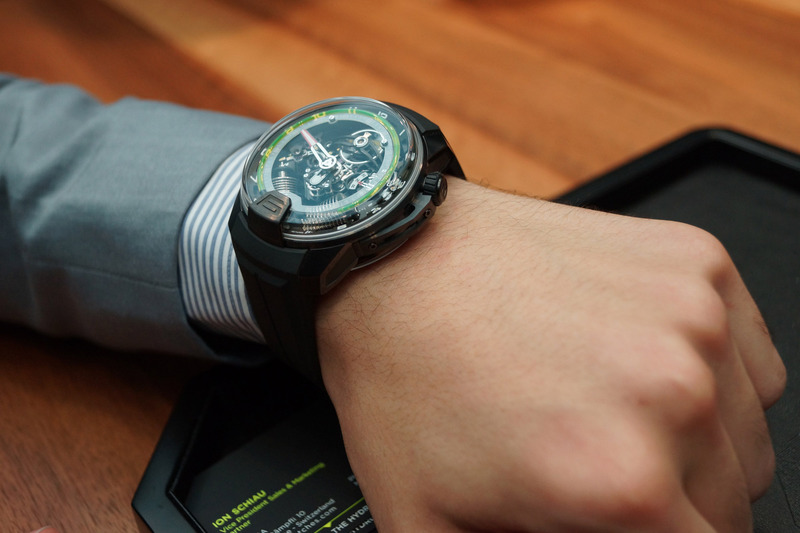 So as you may know I am a big fanatic when it comes to modern horology and alternative time telling methods, so I definitely could not avoid writing an article about one of my favourite modern brands – HYT. 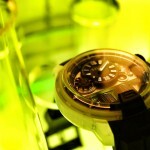 The brand is known today as one of the most innovative watch companies who really keep pushing the boundaries of time. I intend to tell you a little about the watchmakers behind the Hydro Mechanical time as well as give you a couple of guided tours inside the factories. 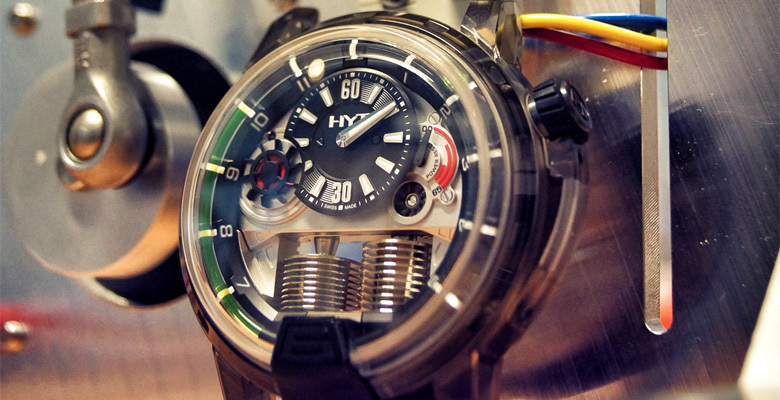 As everything else, the HYT project started with an idea, 11 years back in 2002, when Lucien Vouillamoz has come up with a crazy (by then) concept of creating a liquid wristwatch that would use water to show time. 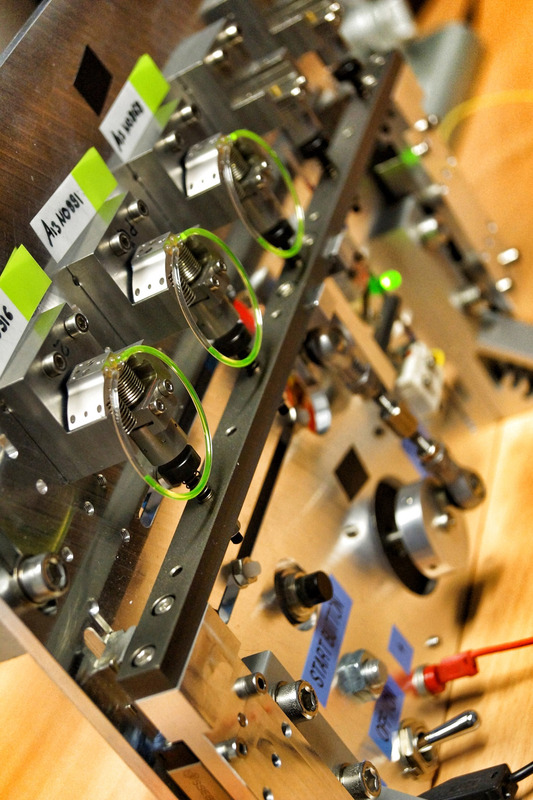 Of course at that time there was no understanding of how to do that simply because no one was persistent enough to get this project ‘flowing’ (if you know what I mean). 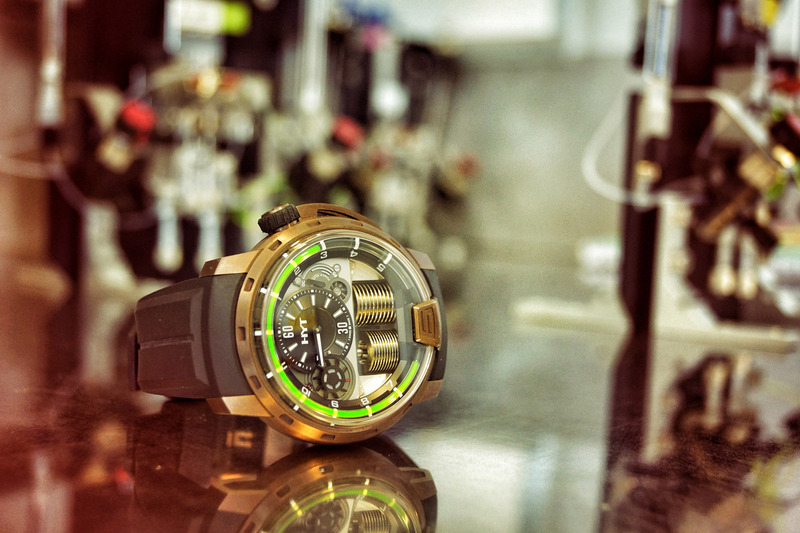 After a while Lucien decided to change his concept a little bit and instead of a water watch he was now looking at the idea of having 2 reservoirs and two liquids, and as he spend more than 1 year in research and development he finally came up with a prototype, that he soon protected and used the technology to collaborate with the current CEO of HYT, Vincent Perriard, who has also shared Lucien’s vision about liquid time. 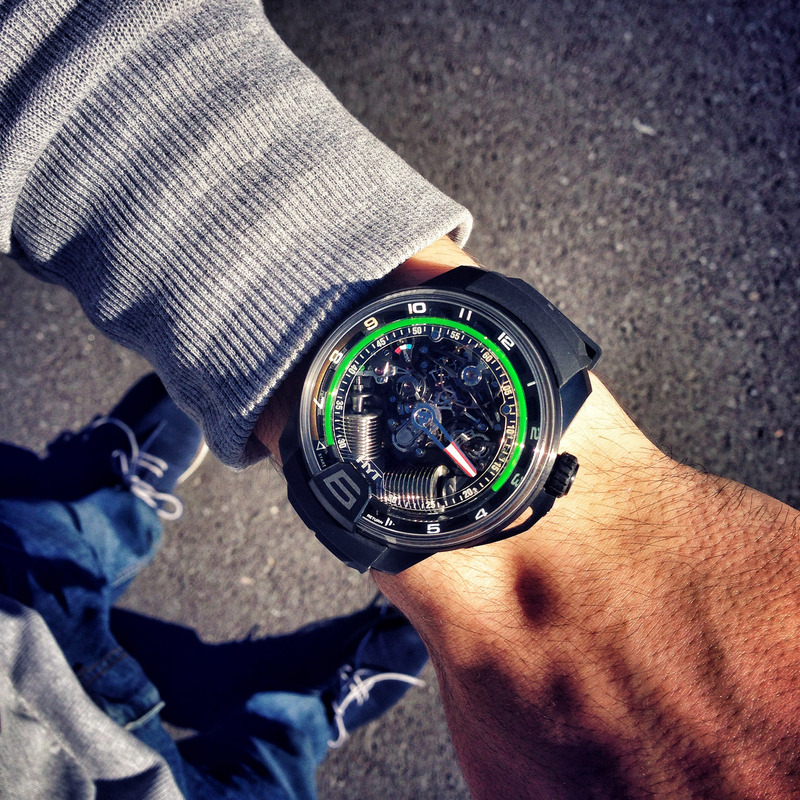 And finally, with ‘Etude de Style’ lab designing the watch, Lucien Vouillamoz supplying the liquid and technology behind it and Jean-Francois Mojon creating the mechanical movement the first watch is made – the HYT H1. 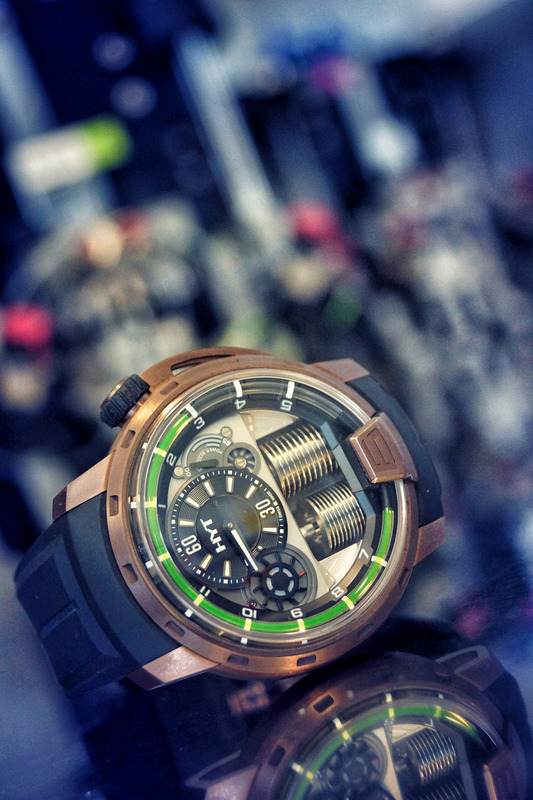 Since the creation of HYT H1, the watch has been altered in the materials used for the casing and today we have a full range of HYT H1 models starting from titanium, to Black-DLC or Pink Gold (and even bronze). 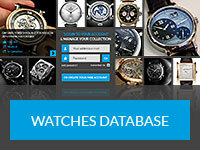 However all of the watches share one thing in common – that is the way the time is displayed, and the movement is shown. 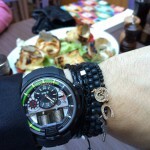 So before I get into how the liquid works and how the watch is made I want to talk about the timepieces themselves. 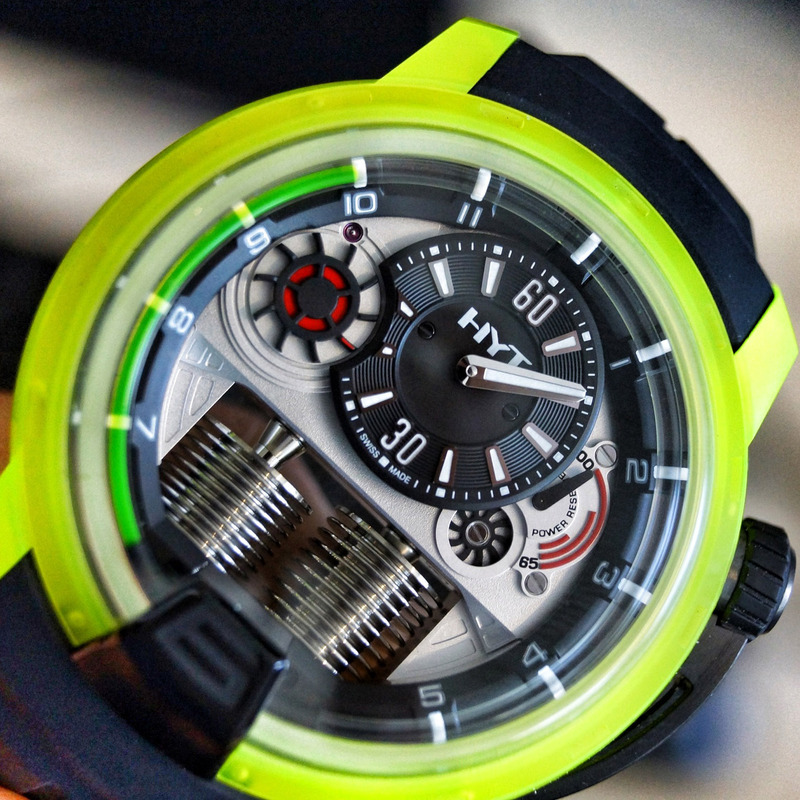 Starting with the HYT H1, the liquid (flowing in the tube around the watch, from 7 to 5 o’clock) shows you the hours. As the liquid reaches 6 o’clock it retrogrades back to the start in one minute, and counts another 6 hours. 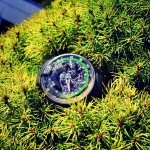 Meanwhile the minutes are in a separate sub-dial at 12 o’clock, showing more traditional way of time-display; and seconds are shaped into a turbine or a funky gear, located at 10 o’clock. 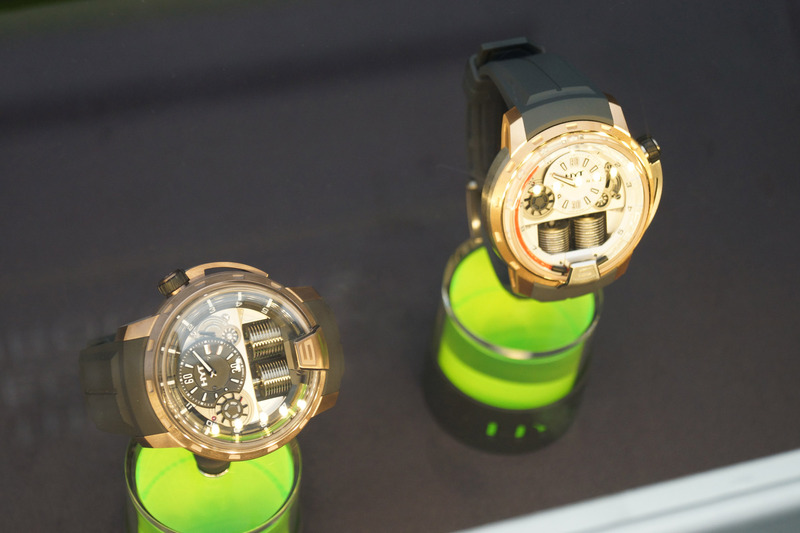 What you have between the 1 and 2 o’clock is the power reserve indicator of 65 hours (which is quite a bit, actually). Now to the big question, how does the watch work? Well, first of all combining liquids and mechanics isn’t easy, and this science involves such terminology like thermo and metaphysics. But even so, I will try to break it down for you guys and make the concept as comprehensible as I can. As I’ve mentioned already, there isn’t just one liquid. The reason for that is so the time can retrograde back (first liquid being pushed by the second). 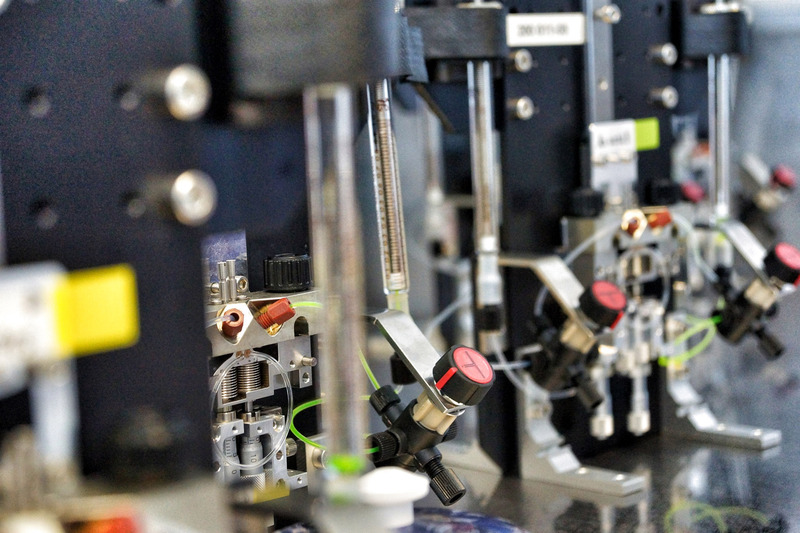 The first problem and R&D task here is to find the 2 liquids that would not merge when mixed and still have that bright green color… And on top of that both liquids have to be resistant to water, shocks, temperature changes and vibrations. As soon as that job was done another question came up – how to store the liquid when it is being pushed in, and how to push it back? 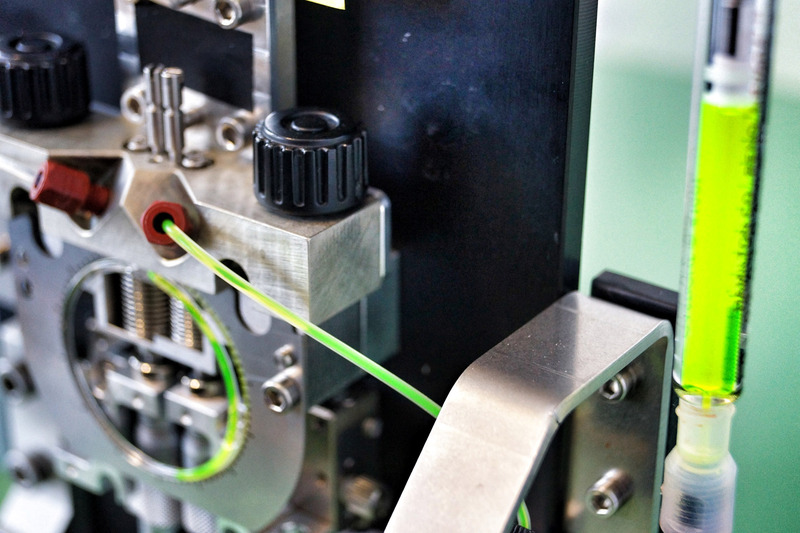 HYT, together with Preciflex have developed a system that uses bellows (the 2 little tanks) made of alloy resistant to any factors that might affect their functionality. 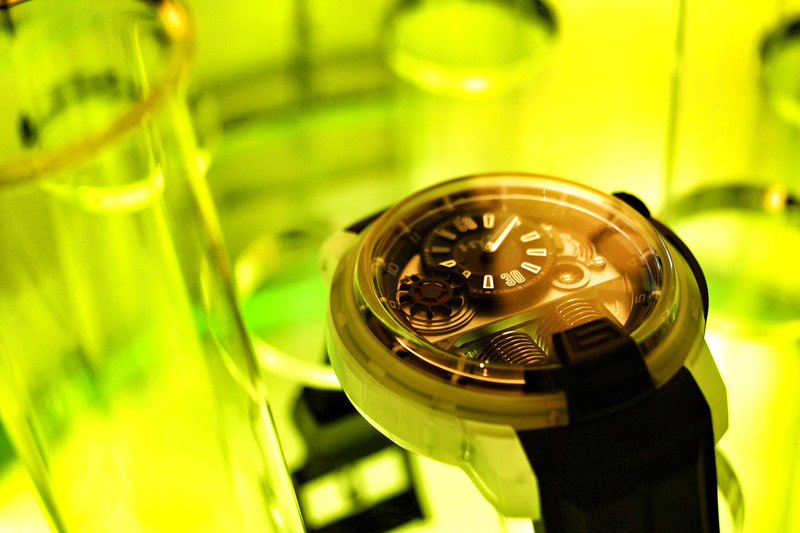 Of course when that process is done the liquid movement (as well as the mechanical) needed testing, to undergo all the bad potential conditions for the watch. 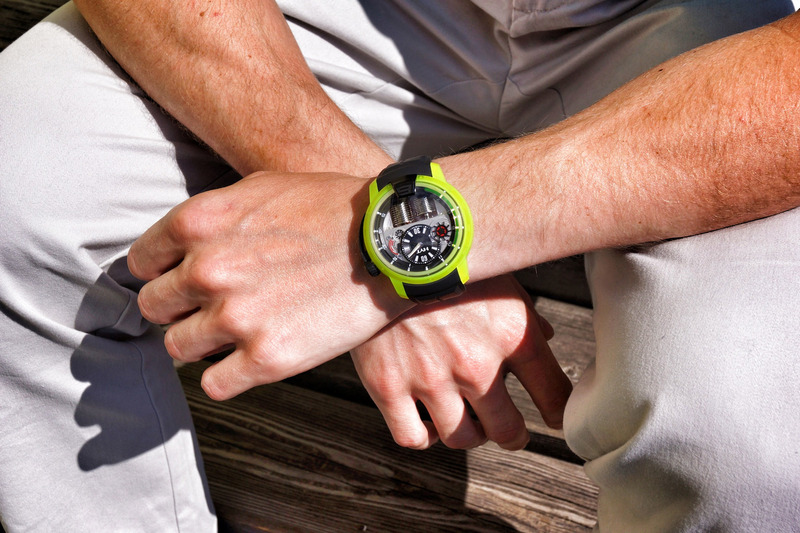 And while some say the temperature affects the watch it is not true as long as you wear it. I tested it in Geneva just now and will be taking it with me to Moscow (that’s pretty cold). I doubt that whoever is willing to invest in a piece like this as well as choose it over the more traditional watch brands will just leave his watch in the snow and walk away ? Now, that you are more familiar with the brand and technology behind it a little more I can tell you a bit about the other models. 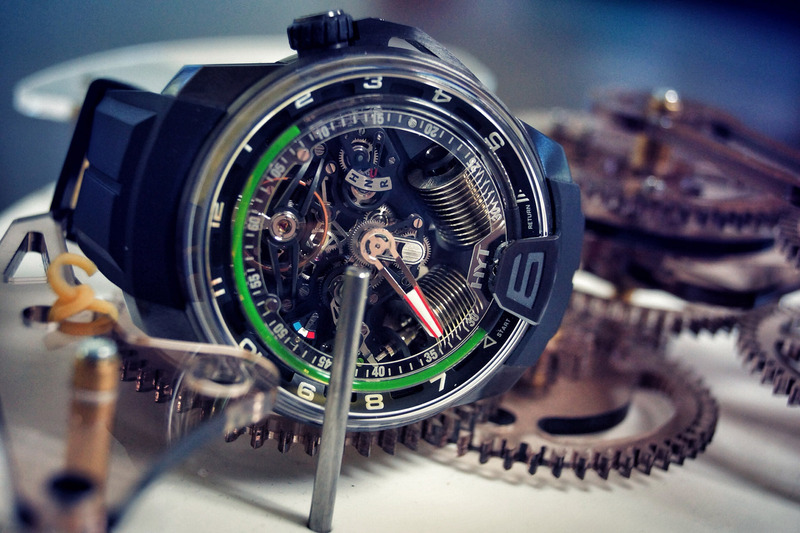 The HYT H1 does not just end at different casing materials, as the design of the watch proved to be very successful the creators decided to add a new ‘flavor’ by changing the color of the liquid from green to red. And if you think it was easy to do, it wasn’t! 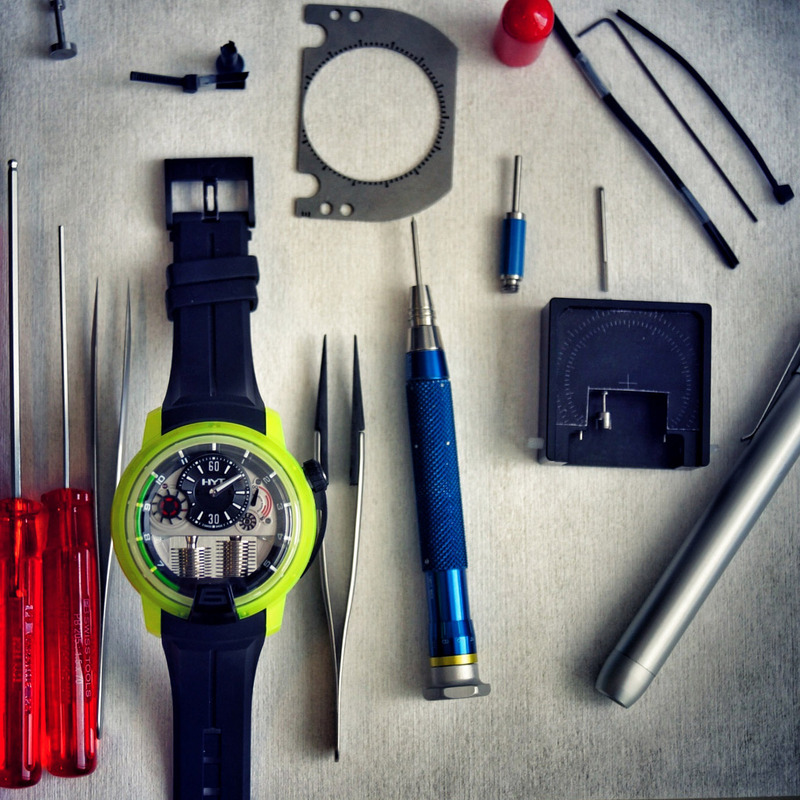 Even a tiny difference in the original mix could cause disturbance in the liquid, so the R&D department had to gear up again and find a new, red liquid to fit the watch. 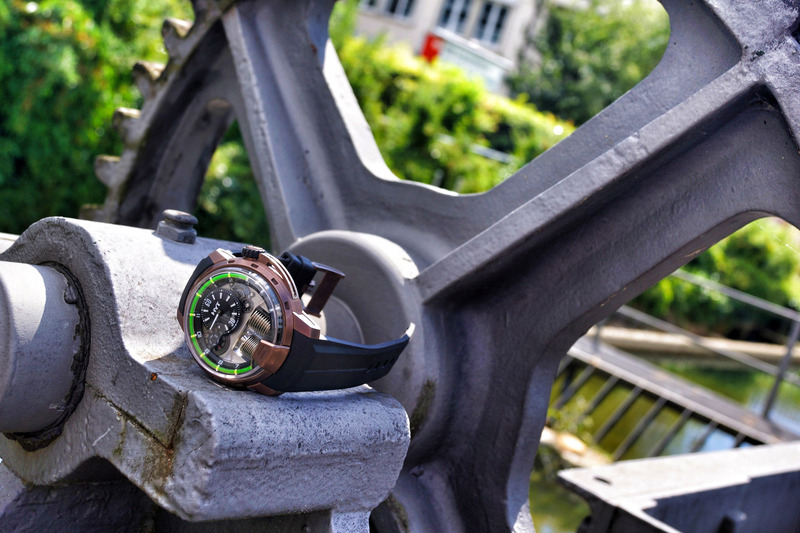 Another cool invention was the 2 new watches in the H1 line – the Azo and Graphite projects, made of polyepoxyde, a very light and cool looking mix (especially with the green Azo version). 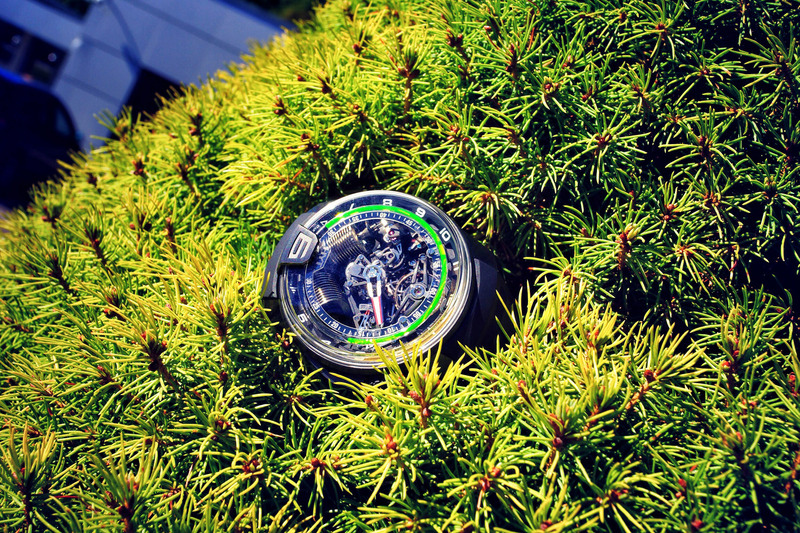 The next challenge for HYT this year was to show us something even better than the HYT H1, a new watch that would stand on its own, while still taking the roots from the liquid time display. Together with the famous APRP factory (Audemars Piguet Renaud Papi) the brand has managed to design and produce a completely different watch! What are the differences? 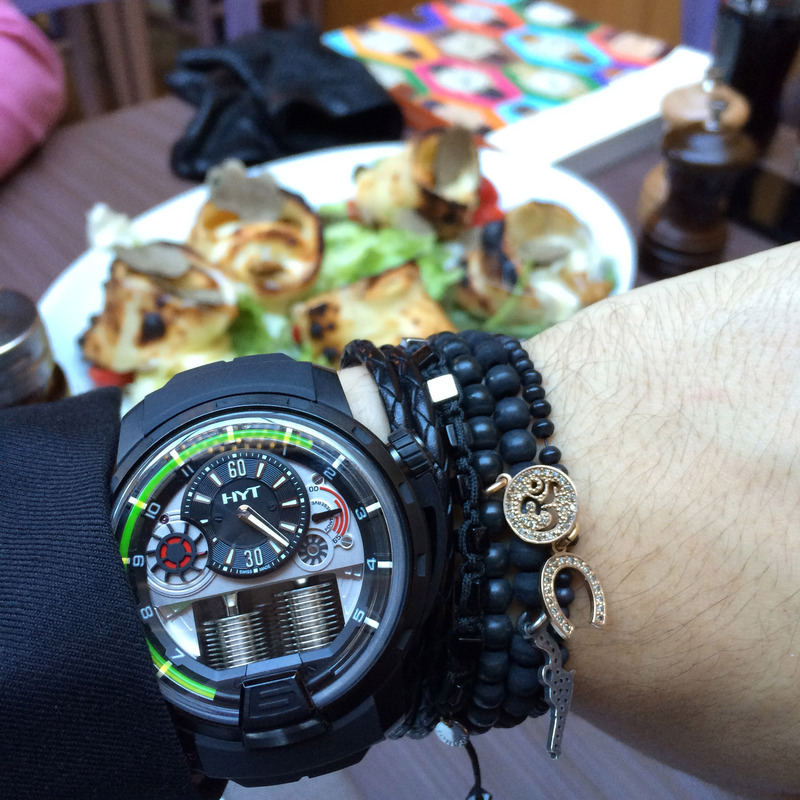 Well, aside from the obvious look change you can now see the mechanical movement on the front side of the watch. The bellows now also take a new shape, being formed in a racing car’s ‘V’. Another racing element about the watch is that now you can see the position of the crown at 3 o’clock with a very cool ‘gear stick’ hand. At 9 you have another hand, now showing you the optimal temperature for the watch (and also reminding me of the French flag ? ). 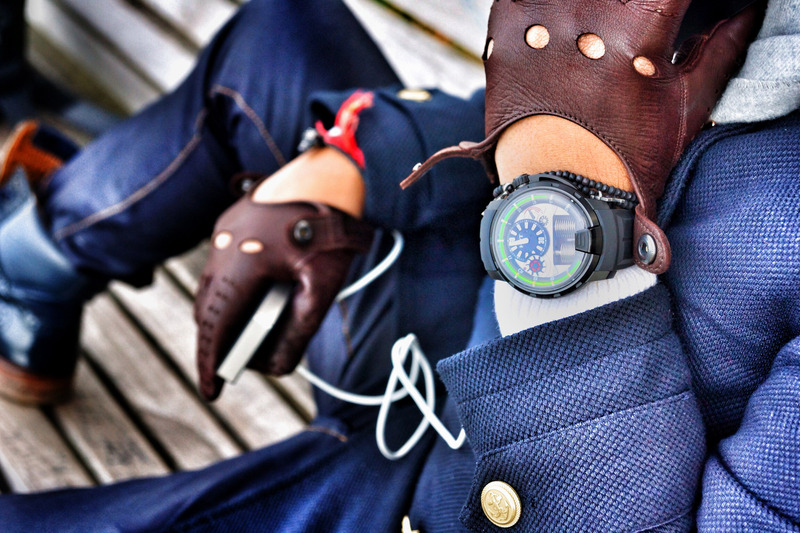 The minute hand now has escaped from the sub-dial and is completely centered. 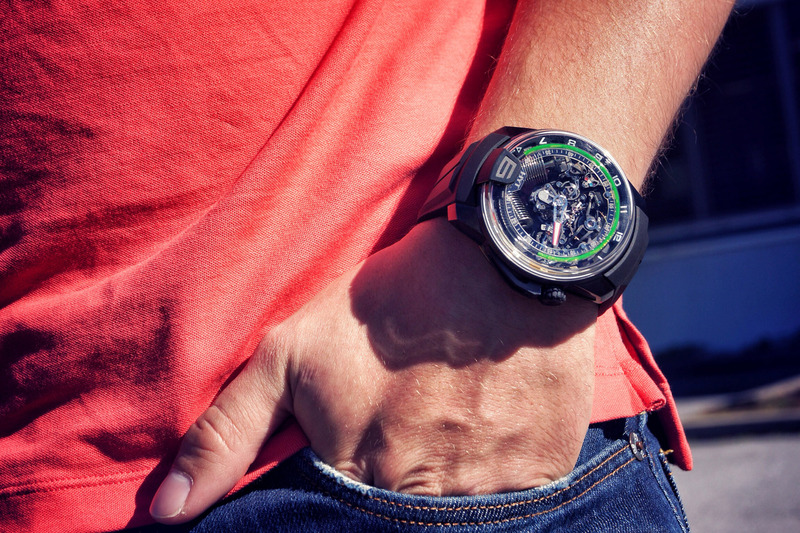 And although the complexity of this new movement has affected the price of the new HYT H2 (around $110’000) I think the piece is really worth it. Other than these changes, the working principal and idea of the watch is pretty similar to the first model, and I am really looking forward to see what HYT will surprise us with at the next year’s Baselworld (which is only months away from now)! Thank you for reading the post and I hope you now have a better understanding of ‘liquid time’ ? More resources about the HYT H1 on AskMen, aBlogToWatch, The Horophile and Official HYT Website.